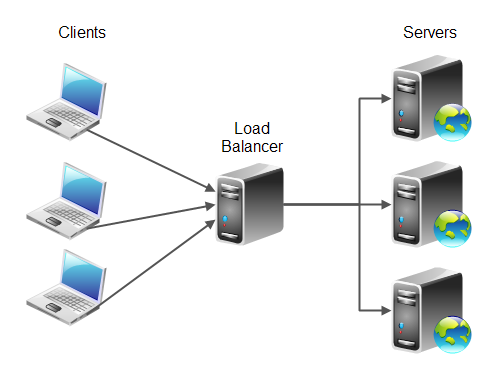 In computing, load balancing distributes workloads across multiple computing resources, such as computers, a computer cluster, network links, central processing units or disk drives. Load balancing aims to optimize resource use, maximize throughput, minimize response time, and avoid overload of any single resource. Using multiple components with load balancing instead of a single component may increase reliability and availability through redundancy. Load balancing usually involves dedicated software or hardware, such as a multilayer switch or a Domain Name System server process. Load balancing is a core networking solution responsible for distributing incoming traffic among servers hosting the same application content. By balancing application requests across multiple servers, a load balancer prevents any application server from becoming a single point of failure, thus improving overall application availability and responsiveness. For example, when one application server becomes unavailable, the load balancer simply directs all new application requests to other available servers in the pool. Load balancers also improve server utilization and maximize availability. Load balancing is the most straightforward method of scaling out an application server infrastructure. As application demand increases, new servers can be easily added to the resource pool, and the load balancer will immediately begin sending traffic to the new server. Network Load Balancing, a clustering technology included in the Microsoft Windows 2000 Advanced Server and Datacenter Server operating systems, enhances the scalability and availability of mission-critical, TCP/IP-based services, such as Web, Terminal Services, virtual private networking, and streaming media servers. This component runs within cluster hosts as part of the Windows 2000 operating system and requires no dedicated hardware support. To scale performance, Network Load Balancing distributes IP traffic across multiple cluster hosts. It also ensures high availability by detecting host failures and automatically redistributing traffic to the surviving hosts. Network Load Balancing provides remote controllability and supports rolling upgrades from the Windows NT 4.0 operating system. The unique and fully distributed architecture of Network Load Balancing enables it to deliver very high performance and failover protection, especially in comparison with dispatcher-based load balancers. This white paper describes the key features of this technology and explores its internal architecture and performance characteristics in detail. Network Load Balancing (NLB) is a clustering technology offered by Microsoft as part of all Windows 2000 Server and Windows Server 2003 family operating systems. NLB uses a distributed algorithm to load balance network traffic across a number of hosts, helping to enhance the scalability and availability of mission critical, IP-based services, such as Web, Virtual Private Networking, streaming media, terminal services, proxy and so on. It also provides high availability by detecting host failures and automatically redistributing traffic to operational hosts.